In the late 1890s the Crest Manufacturing Company of Dorchester and Cambridge Massachusetts was making engines, notably the 'Duplex', a small horizontally-opposed air-cooled unit, and "the company furnish drawings and complete running and power gear to customers preferring to assemble their own vehicles". They were therefore one of world's first suppliers of kit-cars. 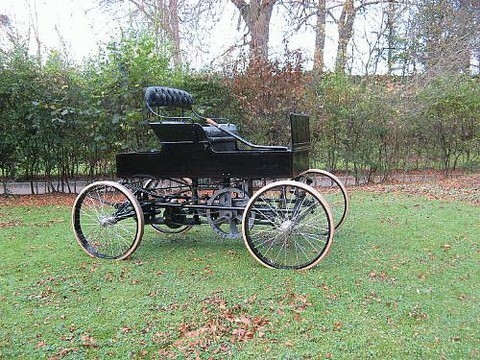 Early in 1901 the company launched the Crestmobile, which was about as basic as a vehicle is possible to be, with a box-like body, rudimentary tubular under-frame, a 2hp single-cylinder air-cooled engine hung vertically at the front, and chain drive. The engines grew through 3½hp to 5hp, still air-cooled, and these were placed under a bonnet, shaft-drive was adopted and the cars took on an appearance akin to that of the contemporary De Dion-Bouton. In 1903 the O'Halloran Brothers of Clerkenwell Road, London, sold Crestmobiles as the 'OHB', the difference between the two not being immediately detectable. Crest was absorbed into the Alden-Sampson truck business in 1905.